Save Marinwood-Lucas Valley - our community, our future: IS CALIFORNIA’S BUBBLE BURSTING? California has a long history of boom and bust cycles, but over the past 25 years or so, California’s cycles appear to be becoming more volatile, with increasing frequency, higher highs, and lower lows. The fast-moving business cycle may not provide the time necessary for many people to recover from previous busts, and may be too limited in its impact. Even now, 22 of California’s 58 counties have unemployment rates of 7.5 percent or higher. Eleven California counties have unemployment rates of at least nine percent. And these, we are told, are the best of times. Policy behavior is predictable throughout the business cycle. Sacramento is awash in cash during a boom, because California’s revenues are more closely related to asset prices than economic activity. 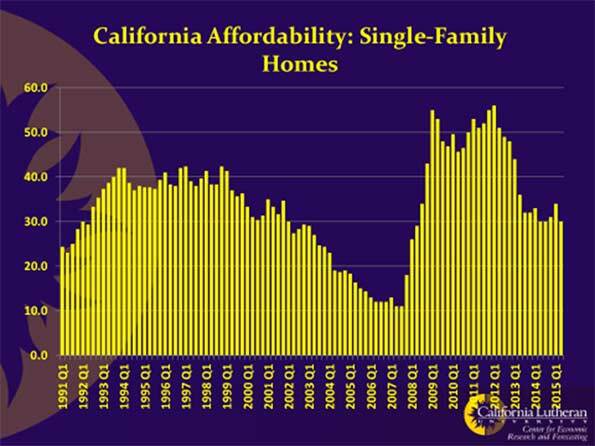 As the economy grows, particularly in an era of ultra-low interest rates, asset prices climb faster than the economy grows, and California is flush. Sacramento acts as if the boom will continue forever. Spending commitments are increased, or taxes are decreased. Politicians congratulate themselves on “fixing” the budget problem. For Sacramento, economic busts and the resulting fiscal crisis are acts of God, completely independent of policy. State revenues fall more rapidly than economic activity falls, because asset prices fall faster than overall economic activity. Sacramento tries to transfer the fiscal pain to local governments. Mostly, they are successful. As of July, Local government employment was still down almost five percent from its pre-recession high, while state government employment is up about 4.5 percent over the same period. Sacramento is currently enjoying a boom, but this boom, like all booms, will ultimately lead to a bust. There are signs that California’s confrontation with its next bust could come soon. Asset prices are cause for concern. After a five-year Bull Market that saw cumulative gains of over 70 percent, the S&P is little changed this year. Over the past 60 days, it’s been very volatile. California’s median home price is up over 70 percent from its recession low. It too has recently shown volatility, reflecting the huge differences between regional markets. Housing affordability (percentage of population that could afford the median home) is down too. It’s fallen from over 50 percent to about 30 percent. We can’t be sure, but it’s probably below a sustainable level. That is, below a level that can sustain a middle-class population. Several California communities have lower levels home ownership rates, but places like Marin County have minimal middle classes. California’s tech sector has served the state well over the past business cycle. In quarter after quarter the Bay Area has led the state in job creation. In many quarters, the Bay Area was the only California region to gain jobs. 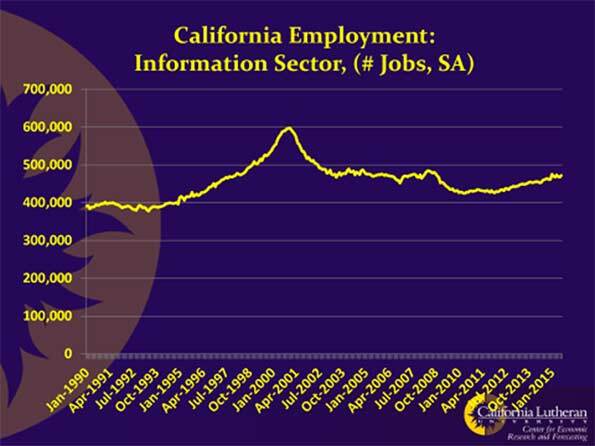 But California’s tech sector can be very volatile, as the last dot.com bust in 2000 showed. 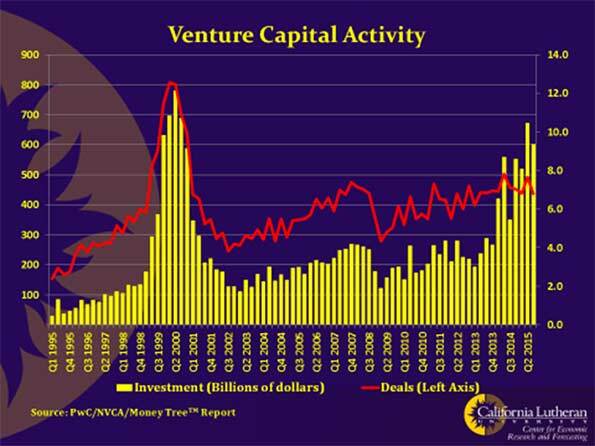 Today, venture capital investment is near the levels we saw just before tech’s big bust. The number of deals is lower though. It’s not clear that it is again a bubble about to bust, the possibility should be seriously considered. Ideally, we would have a plan to deal with the subsequent fiscal challenges. Recent data imply that continued economic growth, even the slow growth we’ve become accustomed to, is threatened. California’s most recent jobs report was a big disappointment. National data was disappointing too. Only 20 states saw employment increases in September. 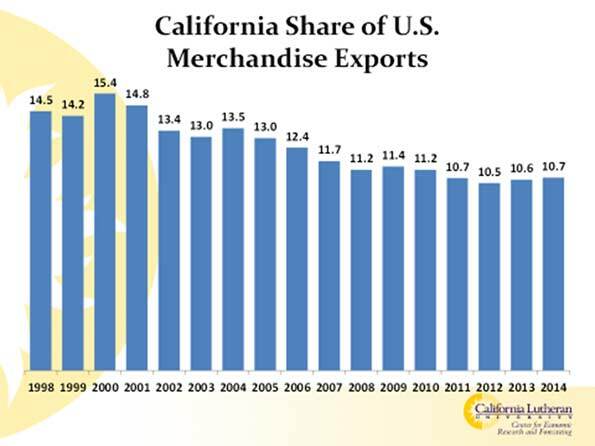 An economic downturn would have a huge impact on California and its citizens. California’s budget surplus is precarious, and the state has failed to make any real changes in California’s fiscal structure. Instead of using California’s period of good fortune to reduce the budget’s vulnerability to volatile asset prices, by broadening the tax base, Sacramento has amazingly elected to increase revenue volatility by augmenting the status quo with a temporary tax. The games that partisan politicians play leads me to the conclusion that they either don’t believe that their policies adversely affect real lives, or they don’t care. Certainly, economic outcomes affect real lives. There is abundant evidence that unemployment and poverty cause drug abuse, domestic violence, broken families, poor health outcomes, and many other social pathologies. The question, then, is do policies affect economic outcomes? In their book Why Nations Fail, Acemoglu and Robinson compare side-by-side communities that appear identical but have different economic outcomes, cities like Nogales Arizona and Nogales Mexico. These two cities, and the other pairs in the book, are identical, except for being in different countries. They are adjacent to other. They have the same resources. They are demographically very similar. They only differ by political regimes. Acemoglu and Robinson find that policy decisions and the inclusiveness of the decision process have dramatic impacts on economic outcomes, and thus people’s lives. California policy is dominated by a rich coastal elite who control most of the media, finance campaigns, rule over the universities and generally dominate all discussion. The result is extreme inequality, persistent nation-leading poverty, high housing costs, and limited opportunity for California’s most disadvantaged populations. And, California’s most disadvantaged will pay the most for California’s next downturn. They won’t write checks, because they can’t. Their net worth won’t decline, because it’s already at or below zero. They’ll pay a far higher cost in broken homes, broken families, and broken lives.